Margaret welcomed us and called us to worship and led us in acknowledgement and joy. P. It is our privilege that we can gather together to draw close to each other and our Lord. L. In the previous week we have all experienced many events and emotions. P. Today is the day and this is the time when we can lay all our concerns before our God. L. Let us worship his majesty and praise his great wisdom and love, asking him to turn what is sometimes confusing in our lives into part of the great mission of spreading his work of restoration. P. Be with us O God. May we know your presence among us. Hymn TIS 188 "Where wide sky rolls down and touches red sand." Let spinifex mulga and waterhole tell - Their joy in the One who made everything well. Elizabeth J. Smith’s beautiful Hymn perfectly captures this amazing joy we can share in God’s world. L. To the glory of God the Father. Leading us in the way we should go. We thank you for your most generous gifts to us. And the gift of belonging we have been given as we journey together here. P. For all these and so much more, we give you praise and adoration. Amen. Confession – Our prayers of Confession were led by Chrisanthi, with Grahame playing some reflective music. L. In penitence and faith, let us confess our sins to Almighty God. L. Our Lord God, we bring before you all our sins: all of our thoughts and actions that lead us to being less than whole. We confess the times each day that we are less than the people we could be if only we had kept our eyes upon you. We confess our sins against our neighbours, not just those in our street or suburb but those in other parts of Australia and overseas, against whom we have sinned by neglect - by looking the other way - by maintaining our ignorance for fear of having to act. We confess, and regret so much, our sins against those we love. Out irritable replies. Our impatience with the weaknesses of others; all the time remaining blind to our own weaknesses and flaws. We confess our neglect of your creation and ask that you will open our eyes to new ways of stewardship. We confess the times we have not even bothered to seek your will, but have blundered on in our own proud way, undoing the magnificence of your plan for the world and us. Margaret delivered those welcome Words of Assurance - If we confess our sins, God is faithful and just to forgive us our sins and cleanse us from all unrighteousness. P. Thanks be to God. Amen. Kaye accepted our offerings for God’s work and Announcements were made. 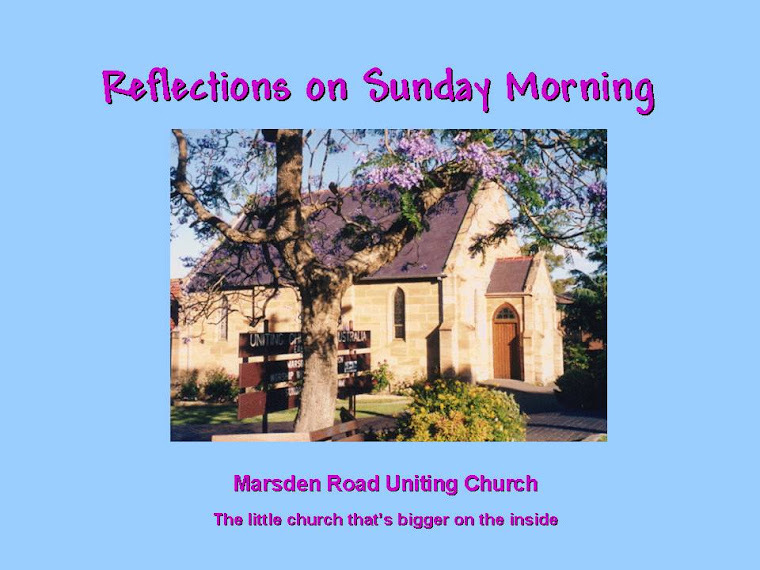 Children's Address – Marcia told the story of David and Goliath for children young and old. 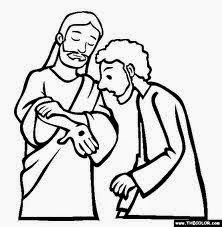 Hymn TIS 232 "O the deep, deep love of Jesus"
First Alan read from Acts about the events following the miracle of the healing of the crippled man begging at the temple. Next we heard about the reaction of the Disciples when Jesus suddenly appeared among them and explained that his death and resurrection had all been explained already in the Scriptures and as witnesses they would be given the gift of God’s Power to go out and offer the gift of forgiveness of their sins to all nations. Reflection Jesus died. Jesus was buried. Jesus lives! I found the “pros and cons” of Margaret’s discussions with various Christian friends, theology lecturers and other “learned people” quite stimulating, although basically I am happy to define miracles as daily happenings – often little things surprising us in an unexpected way with the feeling that God is prodding all of us to make the world better through our Christian love inspired by His love for us. I see many fleeting “miracles” seemingly of little significance to most of society! Yet I can accept the more spectacular and unlikely Biblical Miracles without too much concern; but then -I am not a theological student and am a bit lazy if I am required to think too hard. “In regard to the reading from Luke: if you take the time to read the end of each of the gospels and the beginning of Acts and other references which all cover the time span from Jesus' burial onwards, you will find that there are differences, except these three very important things. There is not enough space here to share all the helpful thoughts that followed, but for me the fact that we are loved exactly the way we are today was the best – we can approach God and he will protect us from our own flaws and stupidity if we admit our imperfections. Even then God is kept busy if we lock him out, thinking we can manage on our own and take back command of our own lives. “The gift of God's love is not like other gifts. We don't put it in a drawer, or on a shelf. We don't even wear it. It flows through us. God's love is ours to pass on to others. In ways big and small. If we were closer to being what we should be, that love would flow naturally, without impediment. Today our message is; “The living Jesus loves you and that love is given to you in overflowing measure to share with the world around you. In that way we can be part of the miracles God works among us. It's your move.” Amen. Hymn TIS 407 "Breathe on me breath of God"
Prayers of the People – Margaret invited us to take time for contemplation and private prayer. She prayed that God would draw us towards our neighbours with love and help us to show God’s Love to the world. Margaret prayed for wisdom for those who govern in any capacity, to meet the needs of the poor and the oppressed, the sick, the uneducated, the depressed, the Spiritually and physically hungry in our midst. She prayed that God’s people in Marsden Road Church will act as his hand and voice as we show his love to the world. We then prayed the Lord’s Prayer. Amen. Hymn TIS 665 "Jesus is Waiting"
Commissioning - Margaret sent us away in Peace – renewed and refreshed in the eternal love of God and prayed that He would make us holy in His Love and enriched by His Grace. That we may be strengthened with joy and blessed and kept in Eternal Life. Amen. Hymn TIS 778 "Shalom to you my friend"
"Uniting in Worship 2" was used as a resource for this Service. through the resurrection of Jesus Christ from the dead. Hallelujah! Christ is risen. He is risen indeed. Richie then welcomed us as one people, in unity with Christians the world over, to hear the good news. Hymn TIS 155 "How great thou art" When we think on how great the blessings are that have been bestowed upon us, our only response can be: How great thou art! In this prayer, Richie spoke of God's amazing creation and of us, as not only as his creation but as the first fruits of his new creation, asking that we will rejoice in this new day. To the God of all majesty, and beyond any estimation of value, Richie offered blessing, glory, honour and power. "We are truly sorry and we humbly repent. And for the sake of your Son Jesus Christ, We ask that you will have mercy on us, and forgive us; that we may delight in your will and walk humbly with you, to the glory of your name. Amen." "Hear then Christ's word of grace to us: 'Your sins are forgiven.'" Hymn TIS 217 "Love divine, all loves excelling" A prayer to God to dwell within us, thereby making us whole, never leaving us. John 20: 19-31 The disciples were hiding away when Jesus appeared among them, showing them his wounds. But Thomas wasn't there and so wouldn't believe their story about Jesus’ visit. But when Jesus visited again, Thomas did believe: "My Lord and my God." 1 John 1:1-2:2 Referring to the risen Jesus, John says: that God is light and in him there is no darkness at all. He continues to warn his readers that we must confess our sins and that when we do that we have an advocate with the Father. Richie began by speaking about the original 12 disciples and speculating about who was the best known. Judas comes to mind as the traitor and Peter was famous for many things but the man that who came to be synonymous with doubt was Thomas. The modern church welcomes doubt, welcomes questions, but not all questions will be answered so the only solution is to step out in faith. Faith in Jesus, trust in Jesus. We are not talking about trusting in what we hear about Jesus. This is trust or faith IN Jesus. Thomas didn't say that he believed that Jesus had risen from the dead. He said, "My Lord and my God." The appearances were not just to establish that he had risen. They were to establish who he was. The church grew because people who never saw Jesus believed in him, trusted in him. "Why have these people believed?" "Why doesn't someone today need the same evidence that Thomas and the others needed? …the difference, I think, is that the subsequent generations of Christians have had the Holy Spirit working in their hearts." Otherwise we would all be dumbfounded. This can happen in many ways: John Wesley, on hearing Martin Luther's preface to the Epistle to the Romans related that "I felt my heart strangely warmed." He had known the story of Jesus for some time but it was only then that he realised God's grace. From our reception of grace comes responsibilities. Richie made the point that Christians should be forgiving sins. When we are confronted with evil - in the myriad of forms it takes in this earth, our task is to forgive. The bible offers more, much more about Jesus but to return to the subject of doubt: "Today, our doubts are put to rest by the presence of the Holy Spirit, if we will only open our hearts to the Spirit's presence." The Offering was received and dedicated to the work of God's kingdom. "Almighty and Eternal God, whose goodness and grace overflowed when you raised Jesus from the dead, Let your goodness and grace continue to flow upon your people." Richie prayed for the stone to be figuratively rolled away for those whose path to new life is blocked; for those in despair and for those in ill-health. Thanks was then given for the life of Luke Shambrook. In the light of the resurrection, Richie prayed for the world: for areas of hostility and violence: areas of famine and disease: for the family of Stephanie Scott and the family of the three children drowned in the lake. Richie, on our behalf, prayed for the church world-wide and at Marsden Road that wise and sensitive leadership be given. We then prayed for those people associated with Marsden Road who are ill or in other need, joining together for The Lord's Prayer. Hymn TIS 380 "Yours be the glory" This hymn reminds us that God's victory is forever. It is the victory that supports us in every part of our life and in every area of our inner being, bringing us new life. "God has loved us with an everlasting love, and even when we were far off, he met us in his son Jesus and brought us home. We come to know Jesus today through the scriptures, through the witness of faithful Christians of all the ages, and through the indwelling of the Holy Spirit. As we have been reminded today: blessed are those who have not seen and yet have believed. And as we go out, let us be assured of that blessing - the blessing of God Almighty: Father, Son and Holy Spirit." Call to worship This is the good news The grave is empty, Christ is risen. Hallelujah! This is the good news Once we were no people, Now we are God’s people. Hallelujah! 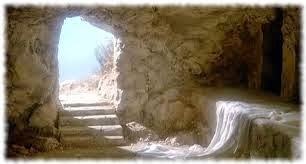 Hymn TIS 370 ‘Christ the Lord is risen today, Alleluia.' As Christ rose, so are we guaranteed liberation from the sin that deadens our soul. We may soar above the banal and downright evil to live lives of victory. Jan began with an Easter prayer, declaring that "early in the morning" God made the world; Jesus was born; Jesus accepted the penalty for doing good; and Jesus rose from the dead. HALLOWED BE THY NAME. She continued the prayer, leading a celebration of all that has happened and asking that our Lord would bring new life, new love, forgiveness, the joy and freedom of the Holy Spirit instead of all those things that drag us into despair. She then, further declared that 'where regret is real, Jesus pronounces his pardon and grants us the right to begin again.’ Thanks be to God. Amen. Hear Christ's words of grace to us. Our sins are forgiven. Hymn TIS 342 ‘When I survey the wondrous cross’ Humility strikes. Pierces our body. We are struck with our own feebleness and weakness and throw ourselves in God's mercy. Bible Readings- ​Laurel read from Isaiah 25:6-9: The prediction of God's triumph and ​​​Mark 16:1-8​: The reality of God's triumph. Jan announced that today we celebrate the resurrection of Christ Jesus our Lord. She reminded us that "the first Easter was an incredible day, one that started with disbelief, with fear and trembling and bewilderment beside an empty tomb, and ended with astonishment, excitement and thanksgiving." Even though the disciples had seen and heard many marvellous things during their time with Jesus, they didn't expect to see him again after his crucifixion. No one expected a resurrection. They were huddled in an upper room - just as we would be. Hiding in fear - just as we would. But "Jesus... was able to break through death and transform it". This restored the hopes of the disciples - this brought to life their uncertain convictions. The details about the sharing of the news concerning Jesus’ resurrection is uncertain as are any details of his appearance to his followers. But the news was shared - that is certain because we are here today celebrating the event - and the frightened disciples would never have had the courage to continue preaching without such a startling revelation as Jesus living. As it was, they went from being people afraid of dying to being people who offered their lives to help others to come to the faith. "God can bring good out of evil, love out of hate, and hope out of despair,"
"The Easter joy of resurrection life is real, when we embrace the life that God has called us to live and to know Jesus’ presence with us always". Amen. Offering We made our freewill offering to be used to spread God's message of new life. Grahame played while we prayed silently. Laurel prayed to God, drawing our attention to the purpose of today being the celebration of God's great love, shown through Jesus' death and resurrection. She asked that we should become partners with God, acting with love and compassion in this world. She reminded us of those shuffering terrible violence, war, hunger, natural disasters, injustice and inequality. She prayed for God to be with them and alleviate their distress, particularly refugees who have left everything they had in search of safety, asking that they be treated with care and respect. At home we prayed for travellers in the present wet conditions and for Malcolm and Lyn as they travel far from us. Laurel prayed for our Marsden Road community and those who cannot do all that they would like to because of their physical condition. Laurel prayed for the particular concerns of the congregation, adding that we feel inadequate in the face of all the needs of which we are aware, so prayed for God's guidance and strength in our attempts to be his hands and voice. We concluded with The Lord's Prayer. Hymn TIS 511​ 'Let us break bread together with the Lord' In all that we do and say may we be directed by God. Always. Jan blessed us: The Peace of God be with you always. And our reply 'And also with you' prepared us for the communion to follow as did our offering of the peace to each other. Jan led us into communion explaining that the table we shared with Jesus and all that love him is also shared with the poor and followed with an invitation for anyone seeking to further or renew their relationship with God to share. Then followed the story of the Last Supper, explaining that we were about to follow that example. The Great Prayer of Thanksgiving ended with a prayer of adoration after which Jan blessed the bread and wine, asking that by sharing in them, we would be renewed. Jan then held the bread and wine aloft, declaring them 'the gifts of God for the people of God." The bread and wine were then distributed. Hymn TIS 376 “I know that my redeemer lives’. Not only a declaration but a celebration. Blessing - TIS 781 ‘Father bless us as we go’ A plea for God to be with us at all times in the coming week.